I’m back in the city after spending the weekend visiting family. It was nice to spend some time in the country but it’s time to get back to the “grind” (hah!). I was hoping to be able to visit some open-pit dumps but apparently they’re all closed down. I remember going to a couple as a kid and having a good time looking at the piles of stuff thrown away by the locals, which included a few old toys I thought were pretty sweet. Over the weekend I sold a couple of things on Ebay – a collection of 32 Egyptian figurines for 95$ and three pairs of old eyeglasses for 55$. I’m pretty happy with the prices I got for each, and I think they symbolize the progress I’ve made as an Ebay seller. In the early afternoon I went to the post office to send these things to their various destinations. 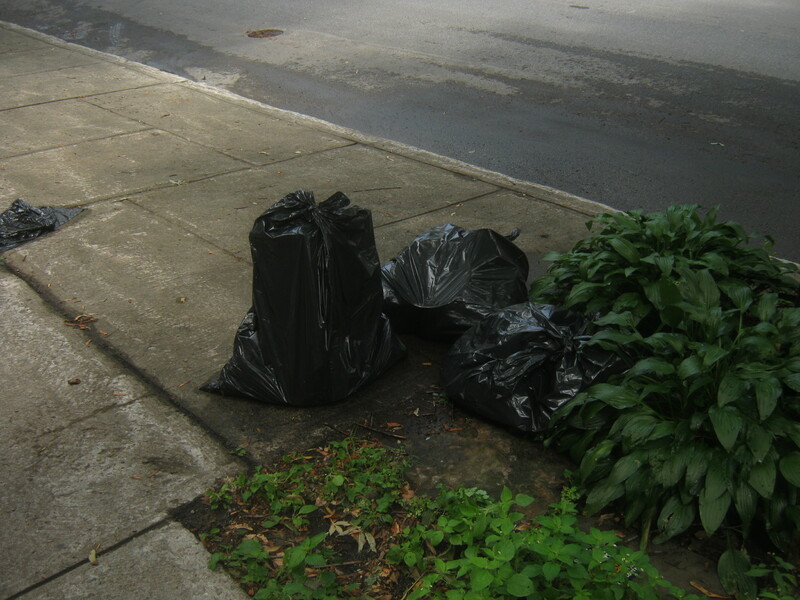 On my way home I saw these trash bags. Their angular shapes piqued my interest and I gave them the “light kick of appreciation”, stimulating the sound which revealed that there was some metal inside. The bags contained kitchenwares – pots and pans and that sort of thing. Most was pretty unexceptional but this piece caught my eye. 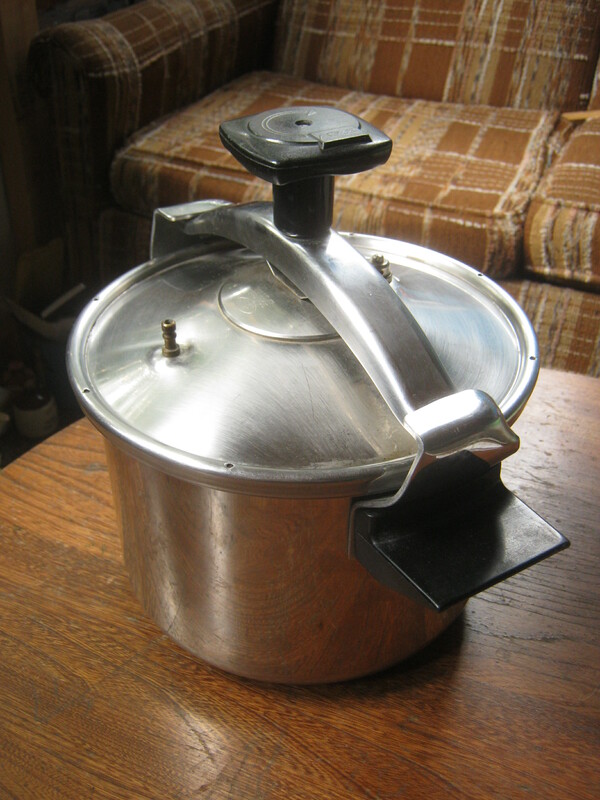 It’s a small pressure cooker / canner made by Seb in France. There doesn’t seem to be anything wrong with it. It’s missing the rubber gasket but I think those are pretty easily replaced. I figured that it must have some value so I looked it up on Ebay. I found one which looked to be the same model that sold for 50$. Not too bad! Still, I think I’ll keep this for myself. I’d like to get into canning at some point and this would obviously be quite useful for that purpose. I have a good feeling about the garbage this week. It’s nearing the end of the month and it looks like the weather is going to be nice. Hopefully that means I’ll find some cool stuff! You can just cook things in a pressure cooker. Beans and brown rice and other things that otherwise take time to cook. Something may be missing, though. There should be a piece that jiggles (and on old pressure cookers would shoot off if pressure got to high). It looks like it’s missing, that it should sit on that piece on the left. I can’t see the right side enough to see if it’s over there, but the left piece looks like the bit on my Lagostina. I am so glad you are back from vacation.Shawville,your hometown, actually was the epicentre of a small earthquake six weeks or two months ago.You never even mentioned it.I hope noone was hurt and no damage was done to your family home.I want to share:I found and retrieved a LIFE magazine from 1968 from a recycling bin on recycling pickup day on Guy Concordia boulevard between St.Antoine and St.Jacques street in Little Burgundy,behind a couple of apartment buildings.From the same recycling bin I salvaged two great ‘Ebony’ magazines from 1980 in superb condition.I hope to keep them at home in my magazine collection for the long haul.There were also 25 to 30 recent Sports Illustrated Weekly magazines in that recycling bin,but I did not take any of them. I bought a pressure canner with a gauge to can with. I have an electric stove so it was stressful and intimidating trying to regulate the temp under the canner. My mom cooked with hers quite a lot when I was growing up, without worrying about it at all. OMG…best not be advertising that Pressure Cooker for sale, or you will be getting some rather unwarranted interest…these ‘things” have become rather famous of late, and you seriously do NOT need the hassle. May well be why someone else put it in garbage,instead of selling it….